3 "I appreciate the effort" stars. 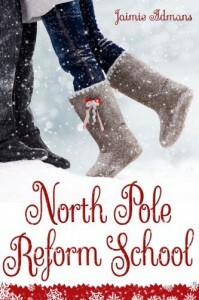 Not bad at all...I think most people adored North Pole Reform School more than I did. In all fairness, the humor was well-timed, the flirting was sweet, and there were enough sugary feel-good holiday moments to satisfy lovers of fun holiday movies near and far. Even though Santa started off as kind of a grouch and zombies surprisingly got a nod, the story stuck with a traditional "what goes on at the north pole" theme, complete with elves and lots of Christmas-related puns and names. Other than a few swear words (which never bother me, but seemed out of place in this particular story), North Pole had a very "family friendly" kind of vibe. If you're looking for a fun book to kick off the holidays with cheer, this might be a story you want to check out. I'm no Grinch, but I think I might have been hoping for a bit more mischief with the words "reform school" in the title.